This article is from the Sep./Oct. 1988 AFRMA Rat & Mouse Tales news-magazine. Is the gene causing “roaning” of the coat a NEW mutation, or has it already been reported in the scientific literature? Are the white bellies on these mice due to the interaction of Tan (at) and Chinchilla (cchcch) genes, producing a “Fox” belly . . . or some other factor? How are the frequent dark markings inherited . . . since they do not follow simple Mendelian laws of dominance or recessiveness? Why do the dark markings often begin or end at the midline of the animal, both on the spine and on the belly? This differs from the common pattern found in other types of marked mice. These questions were intriguing to an old exzoologist like me, so I devoted most of my cages to this strain of mice, in an effort to get some answers. I’ll take them in the order listed above, 1 through 4. Is this roan gene a new mutation? I searched the literature in the Life Sciences Library at the Univ. of CA, Berkeley, up through 1983, and then did an up-to-the-minute computer data search for more recent articles on coat color mutations in mice. There were descriptions of several genes which produce white hairs in the coat, including Flecked (Fk), Freckled (Fkl), dominant roan (Rn), Varitint-Waddler (Va), and Silver (si). All of these except Silver (si) are dominant genes, and our roan is a recessive, so these were eliminated immediately. I wondered if it could be the same as (si), which is the Silver Gray of the English Mouse Fancy. With some difficulty, I obtained some Silver Gray mice and it was immediately apparent that the phenotypes (appearance) are completely different. (I still plan to test cross the roan and Silver Gray to see if these genes occur at the same locus on the chromosome. Even though they are obviously not the same gene, they may be alleles.) At this point, I feel certain that this roan is indeed a new mutation . . . and since it is a recessive, I have provisionally given it the symbol (ro). Therefore, ro/ro mice are roan, and Ro/Ro and Ro/ro mice are non-roan. 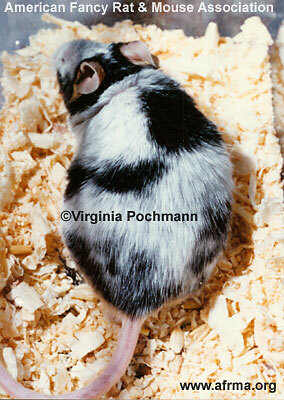 The bellies of ro/ro mice are white, except where “dark marks” occur. These white bellies are an effect reduced by the (ro) gene itself, and are not due to “Fox” effect of cchcch on at. This was proved by first breeding out all Tan bellies (at) from the strain, and also all pied genes (ss) which could confuse the issue by producing white spots on the bellies. When two non-Tan and non-pied roans produce young with pure white bellies, it becomes obvious that the white belly is due to the action of the roan gene (ro) itself. How are the dark markings inherited? This was the toughest question of all, since it immediately became apparent that the dark marks did not follow any pattern of dominant or recessive expression. That is, when pairs of dark-marked animals are mated, approximately 40% (overall) of the offspring will have dark marks and 60% will be unmarked roans. (Out of 256 babies from such matings, 104 had dark marks, 152 did not.) Similarly, when two unmarked roans are mated, dark-marked babies may show up in their litters (though the percentage is much less over all). I puzzled and puzzled over this, and finally got the answer through the related question (no. 4) about why the dark marks begin and end at the midlines on the animals. While reading The Coat Colors of Mice, by Willys K. Silvers, I found a photograph on p. 154, showing a Lilac mouse with a similar pattern of black marks extending out from the midlines. This non-roan mouse’s marks were due to a gene called “p-unstable” (written as pun). This pun gene causes pink eyes and lilac coat color, (just like the usual (p) gene for pink eyes), but in this case is also unstable . . . meaning that during embryonic development, some of the pun/pun cells along the midline of the embryo (which would later give rise to the skin) could easily mutate back to P/pun which allowed the underlying color (Black) to take over the cell. When this occurred during early embryonic life, all the skin cells which subsequently grew from that one mutant cell would produce a black area on the Lilac mouse, which began or ended at the midline. Now, I can’t prove it, but I am going to go out on a limb and say that I am convinced that this spontaneous reversion to underlying coat color (non-roan) is what is occurring here in our roan mice which have dark marks. The allele permitting this would then be “roan-unstable,” and could be written as (roun). This explanation accounts for the fact that the dark-marked animals do not “breed true,” because it is purely a matter of chance which embryos will have patches of skin cells reverting to underlying skin color, and which will not. It also explains why many of the dark markings stop at the midlines, because the skin grows downward from the spine to the middle of the belly on each side of the embryo. An animal showing patches of roan and non-roan in its coat is what is known in genetics as a “mosaic,” since its skin cells are of two distinct genotypes. The roan patches of skin actually have the roan gene in homozygous condition, and the dark-marked patches of skin do not. In the cells of the dark-marked patches, the genes have slipped back to heterozygous state (Ro/roun). A Black Merle (dark marked Roan). By continually selecting mosaic animals for use in matings, we may be concentrating unstable alleles . . . leading to a higher percentage of mosaic mice among the offspring . . . but obviously we will never get them to “breed 100% true,” since every dark mark must originate with a spontaneous reversion to non-roan (Ro) in a skin cell. There should always be some unmarked roans in the litters, in whom no “slippage” occurred during embryonic life. These mosaic animals should be of great interest to scientists. I hope someone in the field of genetics will come forward and let me give him or her some of these fascinating animals to work with.